What is the point of a student notebook? When I was in high school, my physics teacher required that we copy everything that was on the board. I mean EVERYTHING. He told us several times that if he made a stray mark, it should be in our books. If it wasn't, we would lose points when it was collected. At the time, I objected to this because I was lazy and didn't want to write stuff down. Now that I'm a teacher, I object to it because I don't see the educational benefit of it. If we were supposed to have EXACTLY what he put on the board, he should have given us a photocopy of his notes. Even that would not have been terrible if room had been left to write notes to ourselves. I think he did it partly as a power trip, and partly because someone told him that if students are keeping notebooks, they should be graded and the easiest way for that to happen is for everything to look the same. Thinking back on this makes me cringe. From what I can tell, well-intentioned notebooks exist for two reasons. 2) As a CYA measure for teachers to be able to say "Look! I did teach this concept!" I think most teachers who require notebooks do so for the former reason. From everything I've read about Interactive Notebooks, every change in what teachers require is implemented for the purpose of making the notebook a better reference guide for students. If I'm wrong about this, I apologize to everyone who uses them. Maybe a reason I don't use them is that I don't understand. Regardless, with all the talk of INB, I've been spending a good amount of time thinking about my initial question. What is the point of student notebook? Or, more importantly, How can the notebook be a better educational tool for teachers and students? I think that there are very few students who use their notebooks the way that teachers intend or expect them too. I think too often, they write down class stuff, then never look at it again. I have never "required" notebooks because I don't feel qualified to decide what is a good notebook and what isn't, let alone assign a grade based on that judgement. I have always strongly encouraged students to have them and frequently say things like "You should probably write this down" or "this might be a good thing to have in your notebooks for when you study." One of the things I remember from my graduate program is that we should be encouraging, as a method of studying and reinforcement of concepts, students to recopy their notes from the day. We are told that people remember 10% of what they hear, 30% of what they write and 90% of what they teach to someone else (or whatever the real percentages are.) By having them recopy their notes, I guess, we are helping them to remember more of what happened in class, I suppose. On rare occasions, we focus on the "teaching others" part, we do activities like "get into pairs and explain your work to your partner" or sometimes "design a lesson around this topic." These are excellent activities, but I think we can do more. Since starting this blog, I've been thinking about reflective practice. It's important enough that it's a required piece of a teacher portfolio. Why aren't we making our students do this too? I am going to change what I want my students to put in their notebooks. Instead of having a list of things covered in class, I want my students to reflect on the class. Instead of drills as homework, I would rather they go home and write a few paragraphs about what we did, what they learned, what they liked or didn't like, what they want to know more about and general thoughts about what we covered. I want them to teach their notebooks about what we did in class. If including examples helps them to do that, then they should include examples. Pretty, but do they know what to study here? 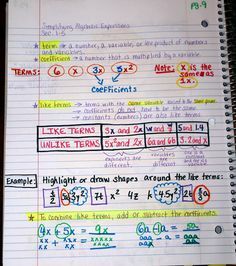 The student notebook should be in the form of a reflective journal or blog. If students want to make it web-based, typed into a word document, or handwritten, they can. I want my homework assignment to be, eventually, "Teach your notebook what you learned today." Write at least 10 lines about what you learned today. If you were to tell your friend what we did in class, what would you say? In sentence form, write 3 things we talked about today, 2 things you found interesting, 1 thing that you think should have been done differently and how it should have been done. Write at least 10 lines about how you, or someone, might use what we did today outside of a school setting. The more I write about this and think about it, the more I love this idea. I don't want my students to just be repositories of facts and formulae. I want them to be able to synthesize new ideas and apply prior knowledge to new problems. I think reflective practice and personal application would be a great way to encourage this. I think it will be slow going at first, and possibly discouraging, with a huge learning curve for both me and the students. To clarify, students should still be writing things down in class, such as examples and topics, but the point would be different. They wouldn't be writing them down for the purpose of referencing while studying. They should be writing them down so that they can write about them later. I know that there are teachers who do math journals. I think my argument is that the math journal and the math notebook should be the same thing. I think the teacher who required you to copy everything he had on the board might have just wanted to make sure you actually read what he wrote. To not leave room for your own work/thoughts etc, was a missed opportunity. I agree with your double edit. That's certainly possible. It's weird to think back about what my teachers did and how I would have done them differently, or the same. I don't remember much from that class aside from the verbatim copying I did. I don't dictate terms on the content of notebooks. I have them keep the front page free for tracking grades, but the rest is really up to them. In fact, I don't give a lot of notes really or do a lot what you would consider "interactive" tasks like the well colored notes you cite. The book is where they collect their classwork. The only grades given on that work are quick completion checks. I use assessments as a way to see what they've retained. Running a class with notebooks need not be as strict or as interactive as what you see people write about. Do something that matches your style. I wanted students to stop sitting through class with an empty desk and a loose wad of worksheets in their backpack. Since starting notebooks, even strugglers have something to show for themselves at the end of the day, and have a greater than 0% chance of producing an assignment they were given. If your student population is more organized by default, repurposing a notebook as a journal is totally cool. There is no standard way to use these things. That's pretty much how I've been doing it so far. My style is very laissez faire. In the high school, if they chose not to do the work, I couldn't make them. I think I took that tack out of laziness though. I would like to continue letting them take notes however they like, but adding the reflective component. I don't know if anyone in my school uses INBs or anything other than the guided note packets that I'm now doing in Geometry so I don't really have a local source to speak with. I will be talking more to the building reading coach for suggestions when I can't come up with topics. Love this!! Hoping to incorporate more writing and journaling as part of regular class rather than stand-alone assignments this year, and this seems like a great place to start. Hope you blog about your progress with this - thanks!!! I certainly will! I may start it out in class, but I also want homework to be more meaningful and this seems like a good way to do that. Full disclosure: I'm trying interactive notebooks this year for the first time. While they might not be a good fit for you, I think the left/right sides of the interactive notebook could work well with what you've laid out. If you asked students to write in-class notes and examples on one side and use the facing side as a place for synthesis, that could become quite powerful. I'd encourage you to include non-text based options for student reflection as some kids will gravitate towards graphic organizers or diagrams instead of sentences. What I've learned in 6 years of teaching 8th grade is that the disorganized outnumber the organized by a ratio of at least 2:1 and most kids don't have any idea what study skills will work for them. Imposing a structure with some flexibility is a gift we can give them before they enter classes in high school or college where there will not be a prescribed method and they will have to invent their own or (hopefully) pull from the best methods their teachers presented when they were younger. I like the left/right set-up very much! Your second point about imposing a flexible structure is something I've been thinking about. I was never taught how to take good notes so I never did. Mine were a collection of stuff I thought might be important but without any cohesion. Thank you very much. I will think about this!